In the process of researching my own garden for the coming growing season, I stumbled across this green gardening technique that made me stop and have yet another EUREKA! moment. The idea? Using old tires as planters for your outdoor garden. Yep, I know. EUREKA! Times 3! This whole idea is a win-win. By using tires in your garden you’re finding a new use for an old, cast-off thing. And, you’re getting a funky, artistic looking planter that no one else will have. Timing: Tires raise soil above ground, which means it warms faster. This gives northern climates an earlier start to a flower or vegetable garden than traditional soil planting. By planting seeds early in a stack of tires and then draping plastic over it, you can create a mini “greenhouse” and get an early start on your garden. Cost: If you want a raised bed in your garden, normally you’d have to build it out of wood. As you can imagine, this costs much more than using old, free tires. Plus, unless you’re using reclaimed wood, you’re using a tree to build your bed. Old tires are more eco-friendly. 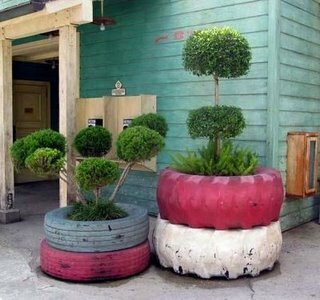 Design: Old tires can be cut and painted a variety of ways, giving your yard a funky, artistic look. Vertical Planting: Stacking tires one on top of another can allow you to grow root crops in a small space. Potatoes do especially well in tire stacks. Also, I read herbs do great in tire planters as well. Design: I know I put design in the “Pros” category, but I can see how some people wouldn’t be into this look. So, it’s in the “Cons” as well. Safety: If you’re planting a vegetable, like potatoes or tomatoes, then you might have to worry about chemicals leaching into the soil from the tires. More on this below. Heat: Because tires are black rubber, they’re going to absorb heat from the sun. Regular raised beds are usually 8-13 degrees warmer than ground soil, and tires will be even warmer than this. So, you’ve got to be careful not to kill your plants with too much sun and heat. Do Recycled Tires Pose A Health Risk? There is no appreciable risk in using recycled tires in the vegetable garden. While it is a fact that rubber tires do contain minute amounts of certain heavy metals, the compounds are tightly bonded within the actual rubber compound and do not leach into the soil. One of the ingredients in the rubber recipe is zinc. Zinc, in fact, is an essential plant element. I also expect that rubber is safer to use than treated lumber that contains copper and arsenic. Now, let’s look at a differing opinion. According to the Editor-In-Chief at Mother Earth News, the answer is yes, tires do pose a long-term health risk. Short-term, yes, tire planters are OK, although the soil in black tire planters will probably get hotter than most plants would prefer. Long-term, no, because the tire rubber will slowly biodegrade and release zinc, carcinogenic PAHs (polycyclic aromatic hydrocarbons) and other toxic compounds into your soil. The final answer? Well, I looked all over the ‘Net and found differing opinions on this. I went to several gardening forums, read articles, the whole nine yards. And, I don’t have an answer. Half of the things I read say yes, old tires are safe because they’re “old”, so most if not all of the chemicals and “off-gassing” is gone. The other half said “No, don’t use tires for vegetables”, because they’re always going to leach. Because of toxic concerns of the public, more than thirty years of internationally marketing and teaching tire crafting and gardening in tires, I expected to receive a lot of factual tire toxic information. We haven’t. Most information has been about toxins and health issues in the manufacture of tires, and toxins emitted from tires when they are burned. Some is about tires leaching toxins when they are ground up or chipped for use as fertilizer, or in hydroponics, or as playground buffers or walking trails. Occasionally, we receive an emotional complaint from an organic purist who will quote from some organic gardening magazine article. From researching the article’s own sources, my conclusion is that toxic evidence was distorted to deceive readers for the purpose of boosting sales. To my knowledge, no legitimate proof has ever emerged that a tire has enough of anything toxic in it to harm humans, and that a solid tire, whith no steel exposed, will leach nothing but carbon and/or sulfur. So, I’m leaving it up to you to decide for yourself. To be super safe, you might just want to use them for plants and shrubs. I was amazed at all the different ways you can use tires in your garden. I found plans to make a compost bin out of tires, hedging fences, retaining walls, you name it! I’m definitely going to do this in my own yard (and risk getting lynched by my uber-conservative neighborhood, who think that white plastic fencing and shrubbery is the ONLY way to go…). I think using recycled tires is a great idea, and painting them definitely adds some funk to the whole affair. What do you guys think? Is this too trashy looking, or can you see the artistic side? Also, if any of you have done this in your own garden, I’d lovelovelove to hear how it went, and any problems you ran into along the way. I’m sure other readers would love to know your experience as well, so please chime in if you can! Ok, so it’s not a planter and I didn’t get more pics (should have, though)… but when I was in Germany last year, I saw a fence around a pasture made of old tires! 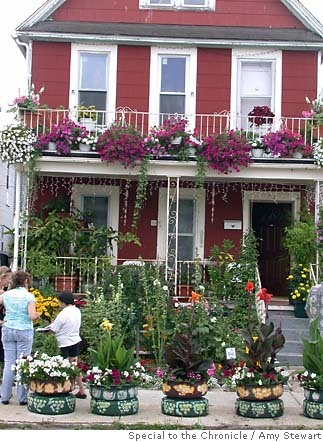 As far as gardening goes, why not use the tires for butterfly attracting plants, for for bird friendly ones? Some plants are even known for pulling toxins out of air, surely there are some that help soil and water as well. Or maybe for those pesky monkey grasses that spread like crazy – if their roots can’t spread outward, what are the odds that they’ll get deep enough to get beyond the tire? Wow, Heidi, those pictures are really cool! When I first looked I really thought it was wood, but when you look closer you can see it’s really tire strips making up the fence. That’s a great idea! I wonder how hard tires are to cut? Your flower and plant suggestions are good ones. Thanks for adding them! I’m using recycled tires to grow potatoes at my community garden. We’re going to stack the tires as the potatoes grow up. Good use of old tires, but should we worry about chemicals leaching out into our food? As for if tires leach toxic chemicals or not it’s a no brainer ! Anything that has toxins in it most likely will leach those compounds over time, even lead crystal is considered by some to pose a mild risk. The rubber in tires is not as stable as glass and if you ever smelled a tire on a hot day you would not even question if they off-gas as they do quite a bit. I would not use ANYTHING in my veg garden that I would not feel comfortable with putting in my mouth. Face it whatever you put in the ground ends up it your food – horse manure, chicken droppings, mulch, everything and whatever chem’s are mixed in them too – end of story ! No I would not eat manure but Kids on farms play in manure piles all the time and rarely get sick but I would not eat ground up rubber – ever ! I love the idea of painting them bright colors. I don’t know if I’d uss them for veggies. The info is sketchy. But for roses! YES! Yes, I think I’m just going to use them for flowers; it’s weird that there wasn’t a lot of info, at least that I found, on leaching. Eric X makes a great point; you shouldn’t use anything in your garden that you wouldn’t want to put in your mouth! The farmer next door to me has about a dozen tractor size tires in the field next to my yard. Maybe I will use them to plant some shrubs. I like the idea of using them rather than letting them lay and collect water for breeding of mosquitoes. My Mother has been using a tractor tire as a planter for about 20 years. She just has a shrub surrounded by some flowers in it- No Vegetables. I think this is a great idea. My garden is in my fenced in back yard so I don’t have to worry about what the neighbors think. But I’m really thinking about using tires down one side of my house for ferns. The grass never grows over there so this would be a great idea. Thanks for the post. I’m going out this weekend to get all my supplies for my garden. You might want to check with a used tire place; many will give you tires for free, since they have to pay to dispose of them. I have been putting off raised beds with lack of time and money to buy supplies .. this sounds perfect. I’m off to learn more – thanks! Tomatoes love the extra heat from them. I had quite a slope in my back garden. Some 2 metres over 30, 24 metres wide. Cost of conventional building and retaining materials would have been huge. I began a process of filling in and digging in old tyres that would otherwise have taken up land fill. I planted them out with native trees, shrubs and palms (all doing well despite the drought), and now have a flat lawn and garden area above. The garden (nothing that spectacular) has 3 frog ponds full of local natives, with any storm water reticulating through them once rain water tanks are full. The result has been a very stable wall and backfill/surface. I am always concerned at the toxicity issue, but there isn’t anything obvious. Frogs are booming, reptiles seem to love it and the subsequent bird life is outstanding, including predatory species like magpies, kurrajongs, crows, kookaburras and frogmouths. I live south of Adelaide 13km in the hillsface area. All seems to be working well. That’s so great! It’s too bad you can’t attach pics; I’m sure it looks really cool. And that’s awesome you have so much wildlife! Thanks so much for writing in and sharing your success story! Hopefully more people will hope on board reusing tires in their garden. I use tires for a woomery(image) and have also used them for edging. But as standalone planters they look ugly — and very garish when painted. However they make great containers for plants and I’ve been thinking I’ll use them as garden beds in my vegey patch and pack in between them lawn clippings, paper and other mulch which will rot down . When you use the inner of the tyre like that you have easy access to harvesting and other tasks and can more selectively plant. The mulch bedding will keep the soils snug or cool (I’.m in the sub tropics) and when it roits down I use it as soil fill. I’,m also thinking that with tyres I can frow stiff near bush and treee roots as I sit the gardening on top of the standard earth surface. and with tyres it’s easy to move the beds around. Previously I’ve been using old bits of rocks and concrete to mark off my beds but I think I’ll have more control if I use blocks of tyres in selected patterns. I estimate that there are 3-5 thousand tires, but I don’t have an exact count. They are located outside of Commerce, Tx Let me know if you think you might have a need for the majority of them, or know of someone who does. Yours is one of the better posts online about this topic. I’ve been accumulating info — (see my bookmarks). I’ve begun to experiment by exploring the use of tires for vegetable growing in sub tropical Brisbane, Australia. So far it has been excellent. The tires allow me to garden in a sort of circular one square metre way by focusing on sowing and layout patters formed by the tire circumferences. So I have these well defined beds to work with and plan for and I can reach across and into all my beds without leaving the path. Because mine is a hot climate and tires are massive thermal storers , I bury the tires a bit in the ground and heap up the path and mulch around their external sides while also mulching inside the rim, of course. You really have to cut the tires with a blade to make the sides straight up and down so this approach will work. Cutting the tires also reduces the surface area exposed to the sun while increasing the area available for planting and mulching. I’m also experimenting with a lot of stakes to carry my plants up high and for mutual shading. I use tires also to hold my worm farm and create my compost bin. I call this project Garden Noir. When the exercise has settled in a bit more — and I keep running out of tires as I learn how I can make greater use of this resource — I’ll publish a video record. I think there should be a design method for tire gardening akin to One Metre and one foot square gardening but I’ll need to experiment with my potager to work out my planting density. I plant inside the tires and between them where the )( meet and mulch everything including the paths (which are a layer of newspapers and wood ash covered with mulch). The soil quality and worm population is now extremely rich and fertile — especially as my main mulch source is lawn clippings — despite what I thought would have been any high heat being generated from the tire surfaces. Since each tire ‘s soil level is below the ril I have ample room to layer mulch so that I curve the mulch twoard the lip of earch tire. This seems to be very effective. I am also, when planting outside the tire rims, experimenting with border and rambler plants like lemon grass, ceylon spinach and nasturtiums as fill as these are favorite Permaculture species here. We’re in the Shenandoah Valley of the US (Virginia) and planning to start a raised bed vegetable garden, with an area that uses old tires. Would a liner — such as a 3 mil black contractor’s bag — in each of our two-tire stacks resolve the apparent small risk of a leaching problem? This is for Dave Riley or anyone who can answer this for us. We love the idea of tire gardening and looked at your bookmarks, which – with more time – will provide most any information we may need to know about the subject (thanks very much) – but I didn’t see anything about how to make and maintain the worm farm. Can you please elaborate on how you did this – it’s a terrific idea! I had problems with maintaining the farm over summer so I simply emptied the whole thing into my garden and treat the whole space as a worm farm. I also a made my compost bins/worm farms out of tyres and the worms come visit those structures big time as they are part of the garden. Soi I’ve expanded my worm farm from a tyre tenement block to a whole country! My veg garden is simply alive with worms now. I use grass clippings to mulch and the worms — tigers — work near the surface. But all you need do is build the worm farm and go for it. The more I explore tyre gardening, the more I am impressed with it as a neglected/recycled resource. Some of the literature suggests that tyres make the soil too hot. Not for me and I live in the subtropics. I cake up mulch both sides of the tires and treat each separate tyre as a mini ecosystem. So plantings, watering, general husbandry… is approached tyre unit by tyre unit. Since I hand water, the spray’s arc is just right to cover the surface area of each tyre. 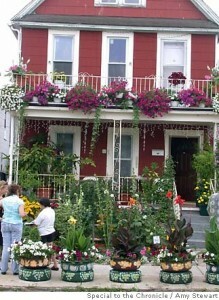 If you are caring for a garden you can see the advantage of that because it breaks down the whole business of gardening into sectors and it’s easy to compare one with the other — even move units around complete with enriched topsoil inside them by first lifting and moving the tyre to a new spot then shoveling the original fill into the relocation. In fact I moved one only today — a kanKong bed the bottom of which I’d covered with old plastic to make a wet and muddy bog to grow the marsh edible. I also cut the tyre rims — except for the ones I use to potato stacks. This is a great little write-up on how to utilize what some believe are useless old tires. My mother has done something just like this in her back garden. She is actually growing vegetables in this raised surface and has found no harm from the chemicals of the tires. I personally am not big into gardening, but I always do remember to pass on my old lawn tires to my mother! With regard leaching chemicals into the ground and hence to any foods grown within these planters, surely a definitive answer could be sought by someone growing let’s say tomatoes and potatoes in a tyre planter and also in a stable organic environment, take base readings of toxins in the soils before growing, during growing and then at harvest time then compare all this data with the toxin levels in the harvested veg.. Surely this will give the answer we all seek? I’m going to build a retaining wall out of tyres for a summer house project on a steep slope in my back garden which will then have a meadow flower and grass roof. My husband and I have planted tomatoes, cantaloupe, radishes, chard and lettuce in tires with good results. We started years ago with tomato plants after our regular garden area apparently became invested with the tomato wilt disease. ( it has a more common name for it but, I can’t think of it at the moment.) We used the tires because we could easily change out the soil from year to year. We had access to old tractor tires which provide a larger area for planting. Gradually the number and variety of plants we have tried has expanded and now we grow mostly in the tires. We don’t grow a lot as we haven’t time for a large garden. The tire gardening makes it easy as we don’t have to use a tiller. With composting and the help of the worms, as well as a decent source of horse manure, we usually have good success. The times it hasn’t worked out is when the weather hasn’t been good (as in a hail storm). I wish there were more sources of information on this type of gardening. I read with interest the ideas of many people from everywhere regarding the use of old tyres and congratulate them on their efforts. Refer my previous note regarding the use of old tyres (200+) to create a retaining wall from june 2009. The wall continues to look good and strong after many years now, with plants and trees growing throughout, and fauna (including a couple of large brown snakes already this year) all doing very well. I will include some pics at some stage. A point that i would like to investigate relates to an old couple who appeared on a TV program here in Australia using large quantities of mulch to limit water use, and claiming a subsequent carbon neutrality for their home and garden as a result. I was wondering from a carbon credit perspective, the very high potential value, of using tyres in the method that i have (essentially buried), as a building material instead of the pollution potential from their destruction, Maybe this would be a point of encouragement for people anywhere to consider the reuse of tyres, where maybe they would not have previously? I have a vegetable garden with tires, We have peppers, tomatoes, cucumbers, pumpkin. All are growing really well, I get the tires from my husbands work, he is a mechanic in the military. We also used 2-liter soda bottles for hanging plants, like beans. observations and this report is at the Earthship site. Suppose u change the soil in them regularly,wouldn’t that solve the chemical problem? I’ve been farming and gardening in Oregon for the last two years, and I first heard of using tires as construction material, from earthship biotecture’s designs. Since then I have come upon some land that came with “free” tires (quite a few of them) and have had to design the system there around them. I originally thought tires were the best free building material ever, and it occurred to me that more building materials would be delivered free to the site of my choosing than I would know what to do with, if I posted so much as a craigslist ad. My first rule of design is, on site procurement of materials. For instance, irrigation does not require expensive pipes if you own a trenching shovel. Don’t bring in any extra tires to a pristine site, but if what you have to work with is an urban landscape, go for it. Tire crumbs are toxic if used as a road surface, but still not as toxic as asphalt. If your alternatives are to process and render new coal tar or petroleum distillates for you project, tires are quite eco friendly. As for leaching, since tires biodegrade so slowly, the toxins come in small quantities that are manageable. As with most cases, bacteria and fungus will come to your rescue here. Methods for employing this are described in more detail by Paul Stamets, and other mycologists; there’s a mushroom for every toxin, it seems. I have a large and growing tyre garden and I love it. The whole chemical leaching thing worried me for a bit, but we eat vegetables and fruit from the supermarket that have more toxins from spray residue in them. My strawberries are fantastic when grown in tyres, keep the heat in, easy to weed and harvest. I tried potatoes grown in tyres but wasn’t too impressed I think the heat in them encouraged blight a bit too much. Pumpkin, cucumbers, zucchini, garlic (has grown huge), tomatoes, spinach, radishes, lettuce all have grown well this season even with the dodgy late frosts in NZ. Thanks for the info on this site will help me answer some questions friends have asked. I love to see that I can also make use of used tires in my garden and it will give a stunning look altogether, I appreciate this quality blog.